This new album from Orchid Classics is a collection of short pieces by composers who were directly influenced by Jazz. Starting and finishing the record will be George Gershwin, the most successful of all those who attempted to notate jazz. These wonderful transcriptions of a suite from Porgy and Bess as well as the Preludes for piano, made for violin by the legendary Jascha Heifetz, have become staples of the violin repertoire. Also featured on the album will be the two best known of all French composers, Debussy and Ravel. The latter in particular was a life-long lover of jazz, and titled the middle movement of his violin sonata ‘Blues’. Back to America and there will be Scott Joplin, Aaron Copland, and finally Wayne Marshall will be multi-tasking in the Sonata for violin with accompaniment of piano and drum (1 player) by the self-proclaimed ‘bad boy of music’, George Antheil. It is no wonder really that a form of music such as Jazz, which managed to combine tight structure and form with such incredible freedom of expression, should fascinate classical composers. Jazz seemed to embody a entirely different world- one of freedom, excesses, and rule (as well as note) bending- a world so much apart from the traditions and confines of Classical music. 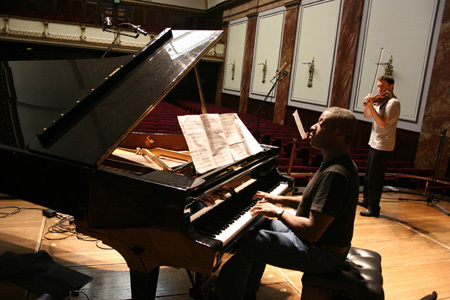 These opposites evidently excited and inspired some of the great musical minds of the 20th Century, many of whom sought to bring elements of jazz directly into their work- whether the syncopated rhythms and ‘blue notes’ employed by Ravel, or the scoring of works for jazz band by Stravinsky. But of all those composers who sought to integrate the concert hall credibility of classical music with the gigantic popular appeal of Jazz George Gershwin (1898-1937) was by far the most successful in this task. During his tragically brief lifetime of just 38 years, Gershwin wrote some of the most beloved works of the 20th century- two of his most successful being the tone poem An American in Paris (1928) and the ‘American folk opera’ for which he is perhaps best remembered, Porgy and Bess. Written in 1935, Porgy started life as a full scale opera but was then adapted less successfully for Broadway. However, in the years since it has been performed around the world, become a major motion picture in 1959, and had songs from it such as Summertime and It ain’t necessarily so covered by a vast range of artists from every genre, from Ella Fitzgerald to legend of the harmonica Larry Adler. Equally famous among lovers of violin music are the transcriptions of Porgy and Bess by the great violinist and friend of Gershwin, Jascha Heifetz. For many centuries before Heifetz violinists were not only performers but also master composers and arrangers for their own instrument – giants of the violin Paganini, Sarasate, Ysaye and Kreisler also left behind major contributions to the violin literature. Heifetz created literally hundreds of transcriptions, many of which are an essential staple of every violinists concert repertoire. While Gershwin’s music may seem firmly rooted in the genres of jazz and music theatre that brought him such fame, his influences stretched far beyond these. He was constantly aware of his own lack of formal musical education, and spent a long time searching for a teacher to fill in what he saw as gaps. One man he approached was Maurice Ravel (1875-1937), who kindly suggested that it would be a shame “to write second rate Ravel when you can write first rate Gershwin.” Ravel’s own fascination with jazz was heavily influencing much of his work, most notably his two piano concertos and the violin sonata of 1923-27, with its middle movement titled ‘Blues’. So often linked with Ravel as the other defining composer of Impressionism was Claude Debussy (1862-1918), whose music also had a real effect on Gershwin. Debussy’s Golliwog’s Cakewalk is a take on one of the earliest precursors of jazz. The Cakewalk was named after the imitations slaves made of their masters walking- arched back, head held high, wrists flapping. It was from this that the rag was spawned, and that’s where Scott Joplin (1868-1917) made his name a legend. ‘The Entertainer’ has become one of the best known tunes in all music. Following the tradition of transcribing that Heifetz made his own, Isaac Perlman composed a book of arrangements on Joplin’s Rags, from which the two on this CD are taken. Another teacher who politely refused Gershwin as a student was Nadia Boulanger, who was responsible for a generation of American composers including Aaron Copland (1900-1990). Copland was admired as a composer by such contemporaries as the notoriously critical Stravinsky, who asked “why call Copland a great American composer? He’s a great composer.” But at the same time he avidly embraced the styles and rhythms of jazz, even writing music for the legendary jazz clarinettist Benny Goodman. Born in the same year as Copland and also a resident of Paris during the 20s, was the American composer and self proclaimed ‘Bad Boy of music’ Georges Antheil (1900-1959). He too was unable to escape the huge and far reaching influence of Stravinsky, but was determined to establish his own voice- and preferably offend some people while he did so. His experimentations with jazz, and his determination to push the boundaries of conventional music led to a ‘Jazz Symphony’ and in 1926 his most famous work ‘Ballet mécanique, which includes the use of electric buzzers and airplane propellers. Though slightly less unusual but still not quite conventional is the Violin Sonata no 2, towards the end of which the pianist is required to switch to percussion while the violinist plays an Arabian style melody.